Medium Holding Plate Dimensions: 14" x 11" x 2.4"
The Water Cooled, Self Pumping (SP**) ASU (Automatic Start Up*) Model 3751 Refrigeration System can cool as a refrigerator or as a freezer. The maximum freezer capacity is 2.3 Cubic Feet and the maximum refrigerator capacity is 7.1 cubic feet. This model is cooled directly by the surrounding water because it includes a Self-Pumping, Sea Water Pump that eliminates the fan and electric pump for quiet operation and offers very low power consumption. Isotherm's ASU Models are equipped with the optional, patented Automatic Start Up System that senses when surplus power is available and stores refrigeration energy in holding plates mounted near freezer compartment. The ASU system can dramatically reduce the drain on your battery. * Isotherm ASU Systems are designed for installations in existing cool boxes and mainly for use in sailing yachts where battery power is at a premium. The ASU system dramatically reduces power consumption while supplying refrigeration in abundance. It senses when surplus power is available from the engine alternator and speeds up the compressor to rapidly freeze the holding plate. When surplus power is no longer available it reduces its energy-use accordingly. The stainless-steel holding plate can be fitted at any suitable angel high up in the box before being connected to the compressor unit by the three meter long six mm diameter flexible copper piping fitted with quick-couplings. 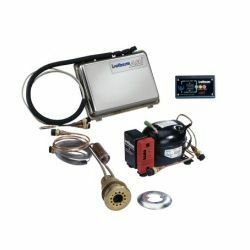 The compressor unit is small enough to be fitted in a stowage within connecting distance from the holding plate. Extremely quiet when running, it can even be fitted under a bunk if needed. After connecting the leads to the battery, the pre-filled system is ready to go. Patented SP System eliminates the fan and electric pump for quiet operation and very low power consumption. Maximum Box Volume cu ft.
** Sea Water-Cooled / Self Pumping: The Isotherm SP unit is a totally new system that is cooled directly by the surrounding water. This means that refrigeration efficiency is completely independent of the air temperature inside the boat. Even on the hottest days of summer - just when a refrigerator is needed most - the sea water cooled Isotherm SP operates consistently at an extremely high level of efficiency insensitive to high ambient temperatures. It also consumes much less battery power as no fans or pumps are required to dissipate the heat generated by the refrigeration compressor. This means that warm water is continuously pumped out and cold water in, movement which also prevents fouling. No extra holes required in hull and nothing protrudes. The one meter long pipe connecting it to the compressor and the 3 meter one from the cold-holding plate are both prefilled and fitted with quick-fit connectors. Although heat always rises if left to the laws of nature, the Isotherm SP unit leads the heat downwards and out through the boat's hull by utilizing the natural pumping action inside the hull fitting for the galley sink drain hose. As this hose is not restricted by pumps or non-return valves, the flow inside is completely free. Each movement of the water surrounding the boat reproduces a similar change of the water level inside the hose resulting in the pumping of a similar quantity of water in and out through the hull fitting. By designing a special hull fitting containing a non-restricting, full-flow spiral heat exchanger for cooling the heated refrigeration agent, an extremely efficient cooling system is created. As the hull fitting is always situated some distance from the boat's center of gravity, even the smallest movement of the hull or mast of a sailing boat is sufficient to create a pumping action even in the calmest of waters. Large Holding Plate Dimensions: 15.7" x 12.6" x 3.6"